Question: The measures of takeover defenses are being studied or not? Answer: We are not neglecting the measures of takeover defenses, but it is the basic attitude of Ricoh that the best measure against takeover is the maximization of the shareholders’ value. 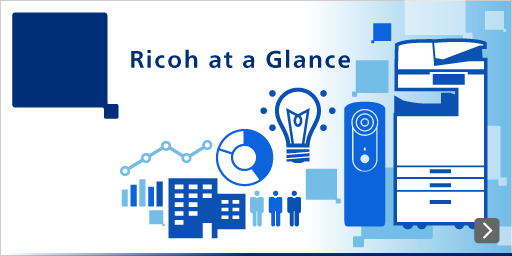 Answer: Ricoh had been making efforts to improve internal control through the Internal Control Promotion Office for a long time. On April this year, we reorganized this office and renamed it the Internal Control Office to implement our internal control system all over the world. The system is a response to the U.S. Sarbanes-Oxley Act (SOX) and is standardized to ensure suitability for Ricoh’s activities. Question: As to the joint venture with IBM, another company precedes you in the production printing market. Please tell us the outlook of this matter. Answer: The size of production printing market is about one trillion yen at present, and we are expecting that it is expanding to 2 to 3 trillion yen. We expect by the joint venture of Ricoh and IBM, the combination of the know-how of IBM’s backbone-system software/hardware and Ricoh’s strong capability of development will provide strong competitiveness. Question: Shouldn’t the Company strengthen its information provision function on Ricoh’s environmental efforts? Answer: Ricoh’s environmental management has consistently received high praise. Answer: We recognize the greater importance of global environmental conservation, and we are thinking from now on to strengthen the Ricoh’s environmental management further, and positively promote the provision of more information to the public. Question: Please explain the aim of the advertising tower of the San-ai Dream Center at Ginza 4-chome. Answer: We think it is important to increase the brand value of the Company. The advertising tower of the San-ai Dream Center is to bring the Ricoh brand to the attention of more people. Question: We have an impression of Ricoh advertising as rather modest. Isn’t more proactive propaganda activity better from the perspective of future recruiting? Answer: Surely there has been such a tendency as you pointed. We are, in consideration of cost-effectiveness, promoting more proactive and world-wide propaganda activities, and are presently starting various concrete plan for them. Question: Please explain the main items of other expenses of non-operating expenses in the Non-consolidated Statements of Income. Answer: The main item of the other expenses is a foreign exchange loss, but on the other hand, in operating profit a foreign exchange gain was recorded.